For 50-year-old Savantaiah, the Green Revolution and its promise of high yields through chemical inputs proved too good to be true. That is because within his own lifetime, he has witnessed the affects that chemicals have had on his land and livelihood. “The soil was ‘burnt’. For farmers in Veeraiahnadoddi, Kanakapura Taluk, the financial burden of debt was a crippling one. They note that being compelled to borrow money from middlemen and money lenders at high interest rates in order to meet the expenses of farming placed many constraints on them. These obligations of debt forced them to sell their produce to the middlemen who leant them money. Unfair measurement practices reduced the economic returns of farming, further weakening farmers’ economic security. Over the years however, Savantaiah has managed to turn things around for himself and his family. And he credits much of this to the organic farming practices he has adopted. One of the first changes on the pathway to a secure and happy future came when he noticed wall paintings around his community promoting the cultivation of indigenous seed varieties. In order to raise awareness of the benefits of sustainable agriculture, indigenous variety seeds and organic farming, GREEN initiates the promotion activities such as wall paintings, radio shows, newsletters etc. It was these activities that first highlighted to Savantaiah the advantages of organic farming. “GREEN’s intervention helped a lot,” he recalls. In its capacity as a catalyst for change, GREEN brought with it a holistic approach that positively impacted many aspects of Savantaiah’s livelihood as a farmer. A Community Seed Bank (CSB) was set up in 2005 in his village of Veeraiahnadoddi under GREEN’s initiation, in an effort to conserve indigenous seed varieties in the area and restore lost biodiversity. As a platform for knowledge dissemination, the CSB encouraged seed exchange and good seed management practices, strengthening seed security in its surrounding communities. “I learnt to save and manage seeds through the seed bank,” says Savantaiah. This was one of the first stepping-stones on his way to becoming an organic farmer. Years of experiential learning through GREEN’s activities support the understanding that indigenous seeds respond well to low cost organic inputs. The re-introduction of these varieties in the area through initiatives such as the CSB provided farmers with an economically viable means to take up organic farming and sustainable agriculture. For Savantaiah and his family, this meant a drastic reduction in the cost of farming. They could now cultivate these varieties through the use of organic inputs prepared mostly at home at little cost to them. This increased family savings, says Savantaiah, and greatly reduced their dependency on loans. He therefore eschewed the use of chemicals in order to take up organic farming. GREEN’s training and capacity building initiatives then empowered him with the skills necessary to come out of a vicious cycle of unsustainable practices. These initiatives leveraged the potential of traditional knowledge to find alternative farm management systems that placed him on a road to sustainability. Savantaiah learnt to prepare organic farm inputs such as poochirimandu, green manure etc. through these training sessions. Eliminating the use of chemicals on his farm improved the health of not only his family, but also that of his livestock. In the course of 7 years, Savantaiah transitioned into organic farming through GREEN’s facilitation. 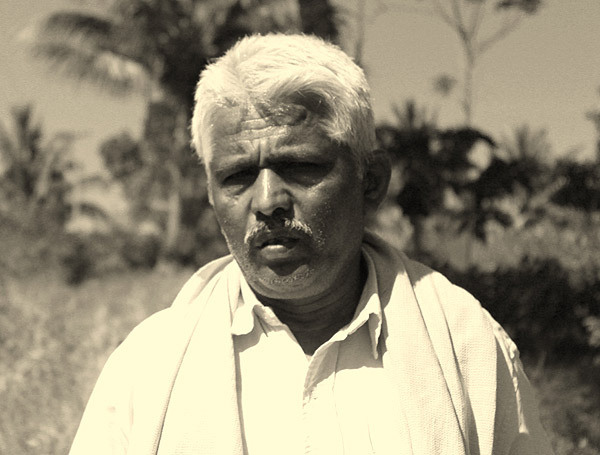 In 2006, he became a part of Janadhanya, a society of like-minded farmers who work to promote organic farming principles as one of their main objectives. The society, which also aims to improve market linkage for community members, allows farmers to fix rates for their produce, a freedom which was previously unavailable to them. He now sells indigenous variety seeds to Janadhanya at fair prices. Savantaiah also enrolled in the Participatory Guarantee System, which provides quality assurance for consumers and buyers of organic produce through a process of peer appraisals. PGS initiatives in his community aim to further increase the economic returns of organic farming.